Drum roll please... my favorite artist is guest blogging today, and guess what? No sewing required! Check her out here to see more great stuff she's made. "As a gigantic fan of The Sewing Dork blog (and the sewing dork herself!) I am beyond flattered to be guest blogging today. 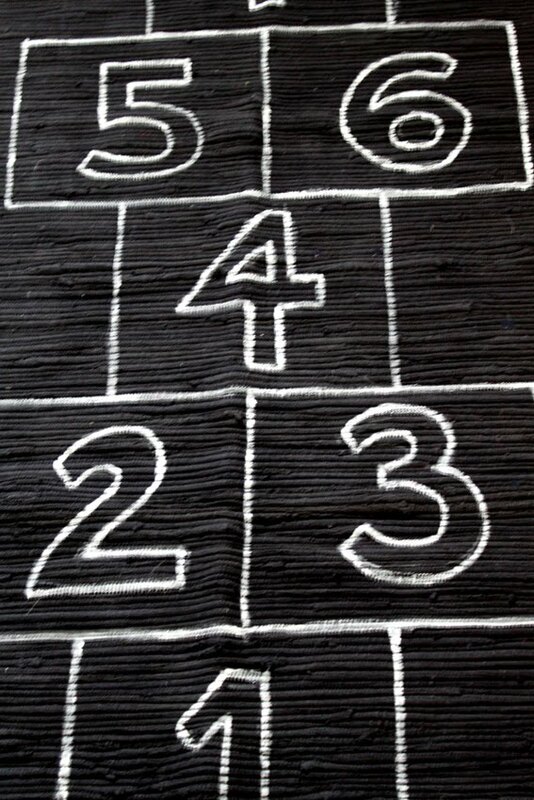 I’m offering a tutorial on how to make a hopscotch rug, based on this one I saw at Crate and Barrel. Mine cost $12. First, I just have to say, as a busy mom of 3 who has never officially blogged before, this was an eye-opener. I commend all those wonderful, creative souls who share their talents, knowledge and life experiences through their blogs...’cause it’s a lot of work! So, I began with a little trip to JYSK to pick up this nubby, black runner on clearance for $10. You think,”SCORE!” but if you’d seen this rug in it’s original shape, covered in lint and dust and other evils, you would probably have said, “eww” and passed it by. My husband thinks it’s an unfortunate talent I have to see the “potential” in things that look like garbage to the naked eye. 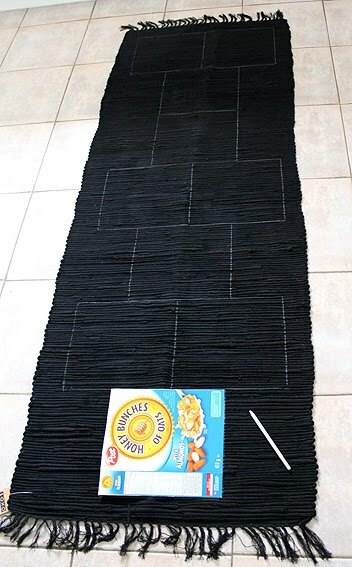 Use the cereal box as a template for the squares. I loved the dome shape on the C&B rug, but I wanted the numbers to go to 10 so it didn’t work in my design. You can use a stencil for the numbers or draw them in freehand like I did. Good thing this allows for shaky hands! Once the chalk outlines are completed, just paint them over with white paint! 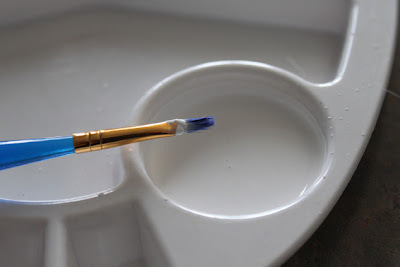 I photographed a fat little brush in the supplies photo, but realized I needed a smaller brush to satisfy the nitpicker in me who wanted cleaner lines and more control. 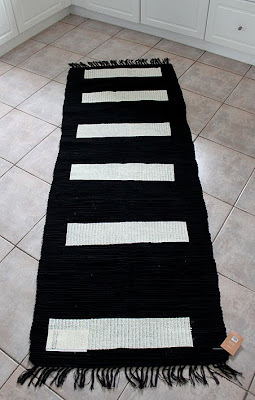 I took the rubbery stuff and cut it into 6 equal strips to attach to the back of the rug so a playful game of hopscotch would not end up in a neck brace for the little darlings. 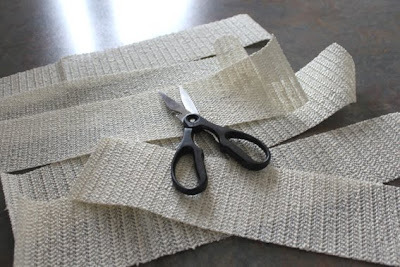 At first I was going to handsew it on, but as a lazy efficient person, after 4 stitches, I realized it would be a very unwise thing to continue so I switched to the woman’s answer to duct tape – HOT GLUE! I enthusiastically hot glued and patted the strips down and my hands looked like I’d waved my hands in my grandma’s attic. 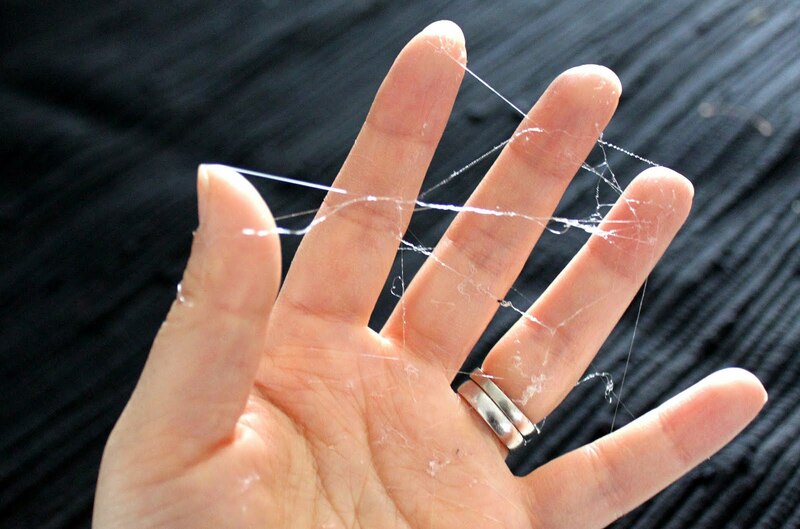 Pulling off the glue, I wasn’t sure what parts were glue and which parts were skin... TMI? 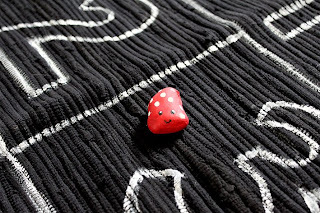 Lastly, paint yourself a cute little ladybug rock. Now pull your child away from her favourite movie and force her to play with and enjoy it! 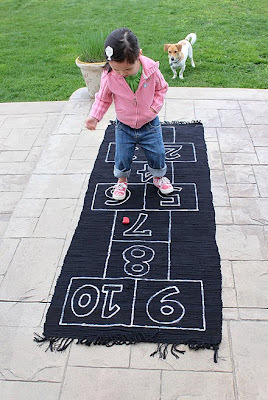 Truthfully, she loved it, but I have to polish up on my hopscotch rules because apparently I was playing it all wrong..."
cute!...i gotta figure out how to play hopscotch cause i think i want to make one! So cute! I just taught my daughter Wednesday how to play last weekend and I had to refresh myself as well...it took a second but I remembered to pick my rock up on the way back! Also, love your lady bug rock, that is a must do! Awesome! My boys will love this as well. And what a great gift idea for summer birthdays. Ladies! Go forth! 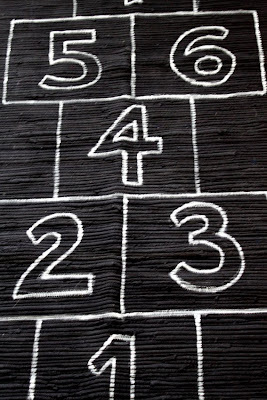 Make your own hopscotch rugs! It's so easy and only took me 1/2 an hour! 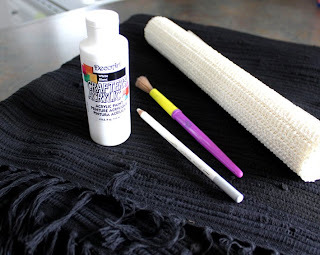 The hardest part was finding the rug, but if you're willing to invest more time, I'm sure you could make the rug with some heavy cloth, a pail of grey or black paint and binding! Wow, I must be excited because I've fulfilled my exclamation mark quota for the day! Thanks for letting me guest blog, Ms. Dork! Does this fabulous guest blogger have a name? This is ridiculously WONDERFUL!! 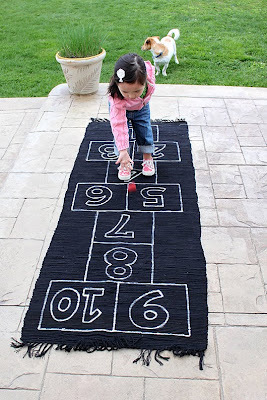 I will find a rug and do this for my kids and probably for a few friends, as well!! Thanks so much for sharing! Your's is SO much nicer than the one at Crate & Barrel! Can't believe they're selling theirs for $200, wow! But awesome job, I love it. LOVE this! My kids are just discovering hopscotch and since we live in an apartment we don't always get to use the sidewalk chalk outside to draw one. 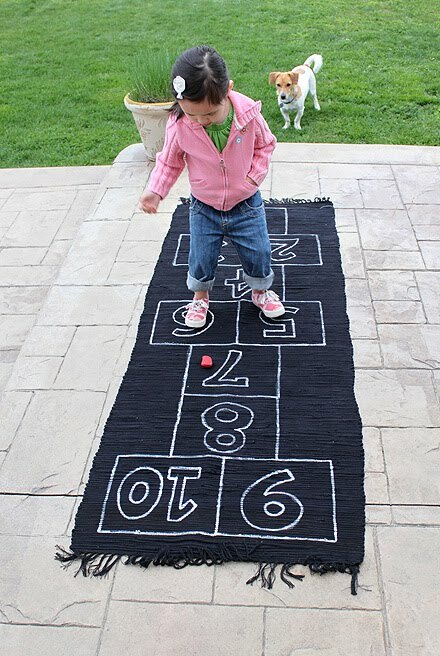 Not only would this solve that problem so that they could have a permanent hopscotch board but it would help on rainy days when there's no going outside at all. 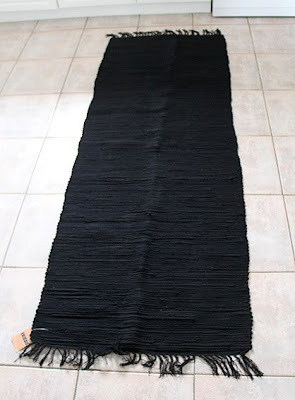 It's really amazing to know that from a simple rug like this one, you can really turn it into an art work! And mothers like me can find better ways of beautifying your rugs at home. And you can find lots of ways also in maintaining the cleanliness of your rugs. In my home in Fort Myers, carpet cleaning team near our community are the ones that I always count on to whenever I want my carpets be clean. Wow that is awesome! I had the same rug on my wishlist for well, awhile but now this is alot more in my budget! My wife and my daughter loves playing hopscotch. Marie enjoys playing with her mom. Last time, when she was playing alone in our living room, she draw the outline of hopscotch on our carpet. When her mom arrived, she was shocked about what Marie did. She told our daughter that she shouldn't draw hopscotch outlines on our carpet again. She cleaned the paint's stain on the carpet but it was really hard to removed. So we asked the help of our trusted cleaner for carpet cleaning. Bartlett, our recent hometown, services for carpet cleaning (Bartlett ILlonois-based) is known for good and reputable carpet services. If you're residing near this place, it would be easier for you to find a good carpet cleaning services. Maybe I can tell this alternative to my wife so they'll have a hopscotch rug and play it anytime. Thank you for this. This is going to be a xmas present for my granddaughter! 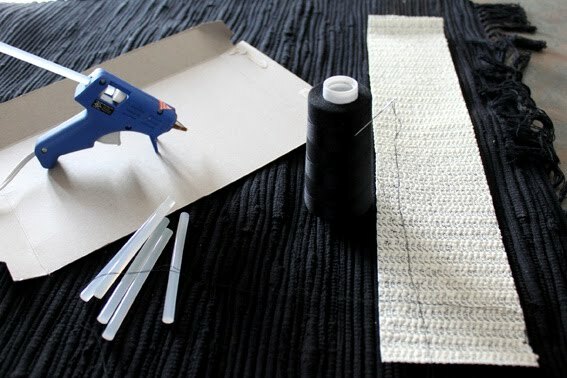 Turn everything over so the right side is facing up and NOW press the RIGHT side sashing over the butted sections of your rug. The folded edge of the top sashing will line up with the stitched line of the sashing on the BACK side. Pin and stitch the RIGHT side sashing close to the folded edge.